Industry Wipes Away 'Got Milk?' Mustache After Sales Take Spill : The Salt The milk industry has a new slogan: "Milk Life." Instead of celebrities and milk mustaches, the new campaign reminds consumers that milk is a source of energy and protein. The milk's industry's new campaign, Milk Life, features ordinary people accomplishing all sorts of tasks after jumpstarting their day with a glass of milk. There's a new slogan in town that will replace "Got Milk?" The famous tagline that encouraged Americans to consume more dairy has been benched by the Milk Processor Education Program, or MilkPEP, the national group of milk processors that launched the campaign back in 1993. The industry is hoping it can win back consumers with the slogan, "Milk Life," after sales declined, year over year, for the last four years. You can read "Milk Life" two ways, says Victor Zaborsy, the marketing director of MilkPEP. "We want people to milk life, meaning getting the most out of their life, really ringing the last drop out of every single moment so that you can enjoy life to the fullest," he says. Or perhaps you'll read it as "living a milk life" — with milk as a central part of a healthy life. The slogan is part of MilkPEP's new $50 million campaign that uses print and digital ads to promote the frothy drink as a nutritious source of energy and protein. Gone are the star-studded images of celebrities sporting the iconic milk mustaches and replacing them are images of what people can accomplish when they drink milk in the morning. "Consumers have forgotten, or never knew, the basic things about milk," says Zaborsky. "About how nutritious it is, particularly about milk's protein." An 8-ounce glass of milk contains 8 grams of protein. "So it's the just the perfect time for us to really put a laser focus on that specific benefit," he says. "And help people understand that starting their day with a glass of milk ... can really help jumpstart their day." In one poster, a young man is pictured break-dancing; in another, a little girl with wings made of milk fearlessly jump into a swimming pool. 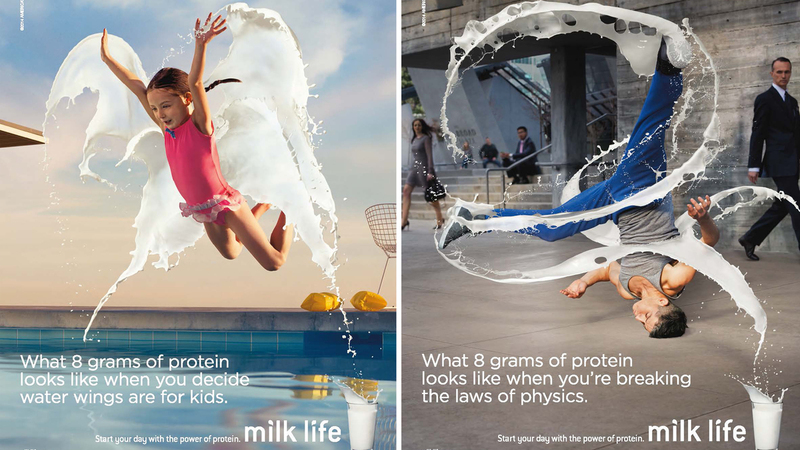 Underneath each image, the text starts out with, "What 8 grams of protein looks like..."
"It is a departure from the milk mustache which is showing that really cool people – people at the top of their game – drink milk," Zaborsky says. "Now we're showing how milk really impacts everyone and helps you live your best life." But Zaborsky notes that while the milk mustaches may no longer be the primary focus, they'll still be used "tactfully," when the occasion calls for it. The new campaign comes at a time when milk consumption has gradually declined thanks to a slew of factors, from the economic recession to the growing number of alternatives to milk and cereal. According to the U.S. Department of Agriculture, between 1977 and 2008, the portion of adolescents and adults who did not drink milk on a given day rose from 41 percent to 54 percent, while the number that drank milk three or more times per day dropped from 13 to 4 percent. The number of children drinking milk also dropped off during the same time period. Zaborski says for most people, drinking milk is an "unconscious" decision and that they rarely consider the nutritional benefits. The new campaign, he says, will help people again "make a conscious choice about whether they're drinking milk or not," he says.